Oceanfront at Honokeana Cove! Gorgeous Unit #203 1br+loft,2 bath. Unit 203 is a 2nd floor, Northwest facing unit that enjoys shade year round on the lanai that directly overlooks the cove with turtles, the heated pool, and a spectacular view of the island of Molokai in the distance as well as Humpback whales December thru April. The lanai also provides a patio table and comfortable chairs for eating or just relaxing. The loft includes a Cal-King and large bathroom with walk-in shower. Main floor bedroom has 2 twin beds that can be bridged together to make a King bed, and a full bath with tub/shower. Both bathrooms are fitted with Kohler High Line toilets. Flat Screen High Definition TV’s are in both bedrooms and a smart Samsung TV in the living room. The living room is comfortably furnished with plenty of room on an L- shape sofa and matching chair. We also offer Free Secure wi-fi in the Unit as well as free calling to Hawaii, the Mainland US and Canada. The kitchen has Granite counter tops, modern appliances, a microwave, oven, refrigerator with ice maker, dishwasher, toaster, blender and a rice cooker. In Honokeana Cove you can enjoy some of the best snorkeling on the island. There is an abundance of green sea turtles, (it’s not a matter if you will see them, it’s a matter of how many), and beautiful tropical fish. You can also enjoy kayaking and paddle boarding. Honokeana Cove is a hidden tropical paradise that you will never forget. Free Parking. No Resort Fees. Discounts available for stays of 10 days or longer, and for last minute bookings. Hawaii taxes remitted by Honokeana Cove Rental Association LLC, Tax ID 067-626-5984-01. This unit has ceiling fans for temperature control. Free off-street parking, limited to one vehicle per rental condo. Please get a rental car large enough to hold your entire party. Heated pool with lounge chairs and outdoor shower, serving only the 38 Honokeana Cove condos. Holidays: 7 night minimum stay for any booking that includes December 25 or January 1. This is our fourth stay at Honokeana Cove Condos. 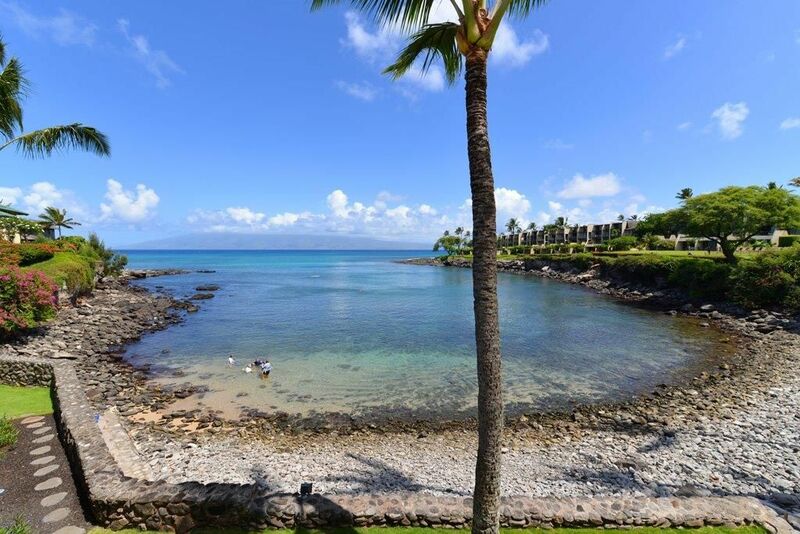 We love the serene setting and access to the cove for snorkeling. The units are well maintained and the staff is very helpful. It was nice to see you return once again. Thank you for the kind remarks and we will be seeing you soon! 203 is a beautiful condo with everything we needed for a relaxing, fun stay. Su and Ray were very helpful and friendly. The New Years dinner was a nice touch and we enjoyed the fireworks. We would definitely like to return in future. The Honokeana Cove property was fantastic. The private cove 8s beautiful, and the location was very quiet. The unit that we stayed in, 203, was great. It is a 2-level unit starting on the 2nd level of the building. While this provided great views, it would be nice to walk directly off of our patio to the pool and cove. The units that we saw were very well maintained and the people managing the property were amazing, from the office to the grounds. They worked very hard to make our stay enjoyable. I would definitely return and recommend it to friends. We have stayed at Honokeana Cove every year for almost 20 years, so obviously we love the place. It is a small family friendly place with outstanding snorkeling and sea turtles everywhere! The 33 units are all individually owned and are kept nicely decorated. The person making you feel most at home is the rental manager, Su Campos. The Cove is such a special place that we hate to share it with more people, but it really is "Maui's Best Kept Secret!" We stayed in 203. Awesome Condo. It was great. It always is at Honokeana. So good that we don’t want it gettting too popular. It is, for us, heaven. Rate range $220-279/night, plus 14.42% Hawaii tax, plus one $180 cleaning fee. VRBO may charge you a service fee. 7 night minimum for December 25 and January 1. Base rate covers 2 guests. Maximum 4. Over 2, add $15/night per person of ANY age. Book online up to 1 year in advance; for longer-term planning call Rental Office. $50 fee for cancellations over 60 days in advance; within 60 days, no refunds. ALL FREE: Internet, Safe, On-Site Parking for 1 Vehicle, Visits with Turtles!